The frontal sinuses are pockets of space located above the eyes and behind the forehead. The sinuses are lined with mucus membrane that secretes fluid to moisten and protect the areas it covers. However, the sinuses can be inflamed or infected by conditions such as nasal polyps, inflammatory diseases, or bacterial or fungal infections. There are a variety of techniques and procedures to treat frontal sinus conditions which include both non-surgical and surgical methods. 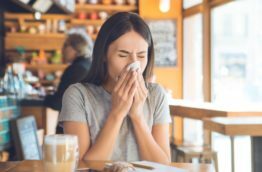 Most doctors will recommend non-surgical treatments, but if that does not alleviate discomfort or frontal sinus infections are a recurring issue, then surgical treatments will be made an option. There are several types of surgeries that have been developed to treat the frontal sinuses, including balloon sinuplasty, anterior etmoidectomy, endoscopic frontal recess dissection, and more. The surgical technique chosen will depend on the specific disease that is affecting the sinuses. Our ENT physicians at Totum Health will be happy to discuss these surgical options and answer any questions you may have about frontal sinus conditions, treatments, and surgeries.